Madison Leitch, then a seventh-grader, writes that she is praying for the men in seminary and thanks them for choosing this vocation. 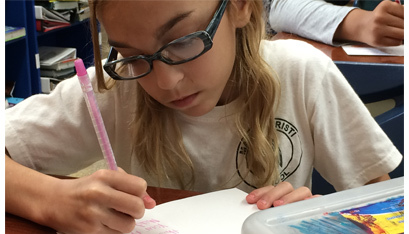 Madison Nunziato works on a card for a seminarian. 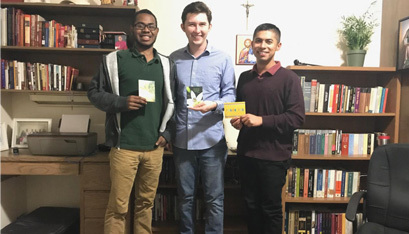 Adopted seminarians shared their cards with seminarians from other dioceses, pictured here, so that they, too, could share in the uplifting project. Annabelle Clemen’s favorite part of the school day is going to religion class. 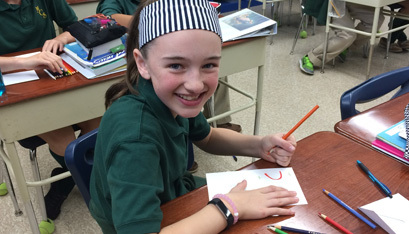 A seventh-grader at Mater Christi School in Albany, Annabelle looks forward to when she can write to her “adopted” class pen-pal: Kyle Gorenski, a seminarian studying at Our Lady of Providence Seminary in Rhode Island. Like Annabelle, other seventh-grade students look forward to the day they get to write to Mr. Gorenski. Each letter is decorated with colorful art and stickers, and filled with encouraging words of support to help their seminarian in his studies. The project is all a part of Mater Christi’s Adopt-a-Seminarian program, which allows students in fifth-to eighth-grade to “adopt” a seminarian as pen-pal, whom they can write letters to and offer words of encouragement or thanks for pursuing God’s call to the priesthood. “They’re just normal guys, [and] it gives them that perspective,” said Janice Jackson, creator and coordinator for the Adopt-a-Seminarian program. One seminarian is assigned to each of the participating grades, explained Mrs. Jackson. This year, the Mater Christi’s fifth-, sixth-, seventh- and eighth-grade classes have “adopted” seminarians Peter Seungtae Kim, Thomas Yakodia, Kyle Gorenski, Matthew Duclos and Stephen Yusko. “As with any letter from home, I’m always appreciative of the time people devote to keeping in touch, especially across an ocean,” said Mr. Duclos, who is currently in seminary at the Pontifical North American College in Rome. “The cards from these students are particularly special because I’m starting to develop a pen-pal connection even without having met them yet. In 2016, Mrs. Jackson got the idea to create the Adopt-a-Seminarian project from her home parish, St. Jude in Wynantskill. Very Rev. Anthony Ligato, pastor and vicar for vocations at the Albany Diocese, had been updating the parish on the growing number of men entering the seminary. Approximately 35 men are either discerning the path or on their way to the priesthood in the Albany Diocese. Of those men, around 22 are currently in seminary. Mrs. Jackson contacted Father Ligato, who connected her with four seminarians who would be interested in receiving letters. Now, the program is into its second year — with a new set of “adopted” seminarians — and still going strong. Mrs. Jackson hangs a poster in the back of her classroom with the current list of men in seminary, and a binder filled with bios on each of the men. Each day, Mrs. Jackson’s classes picks a seminarian from the list to pray for, and looks up their name in the binder to read about who are they are and where they are studying. Every couple of weeks, the class will get to write a letter to their “adopted” pen-pal. Mrs. Jackson tries to align the day with an upcoming holiday, like vocations awareness week, thanksgiving, Christmas or Easter. Last year, Annabelle’s sixth-grade class “adopted” seminarian Samuel Bellafiore. In a reply letter, he mentioned his love for terrible puns and jokes. For the rest of the year, her whole class made sure to include at least one corny pun in each of their letters to him. Last year, a couple of seminarians were able to come in and visit the school. Annabelle said it was great to meet the men they had been writing to all year.